How often is it that you can walk out of your office door in Pismo Beach and say “I feel like having the best burger on Maui” and not twenty minutes later be taking a huge yummy bite? Well it can be as often as every day if you are in San Luis Obispo and now Pismo Beach as Cool Cat Cafe is in town and making new fans! My husband’s office being just around the corner from the SLO location on Broad we were familiar with the yummy fare — including to die for onion rings and fries — or “Frings” which are a basket of half rings/half fries. We had always loved Chele’s in downtown Pismo adjacent to Splash Cafe — a favorite breakfast spot and were sad to see it go. Then in the bat of an eye it had re-opened completely transformed into a 50s diner feel and we were delighted to see that our favorite SLO “Cat” was now just five minutes away. I am one of those that finds something on the menu that I love and repeat every time I visit — and I have to say that the Jailhouse Rock burger smothered with sautéed mushrooms and jack cheese is the one that does it for me. My husband, however, is a burger purist and so it’s all about the Bogy Burger topped with bacon and cheddar. We have to say that the special ingredient that makes most of their delicious burgers, sandwiches and the famous “rings” top the charts is the sweet Maui onions. Their delicious flavor is a fantastic change from traditional onions — even my onion-detesting husband agrees. And why Maui onions you might ask? Because they have a THIRD location on Maui of course in the bustling cruise-ship destination of Lahaina. So it just seemed obvious that it would be a stop on our family vacation there in November. We were curious — would Maui Cool Cat’s have the same great vibe and fantastic food topped off with great service? Well besides the added bonus of having an open-air treehouse feel overlooking the giant banyan tree in the center of town, everything else was the same — even the menu items! We were treated with friendly service more than one time when we visited — and they were delighted we lived near the other locations. We enjoyed yummy island drinks and our favorite “Maui Onions” were grown locally. Fun to have the 50s diner feel transplanted to the treetops of Lahaina — and great to have a familiar hangout when feeling like you need a dose of home! 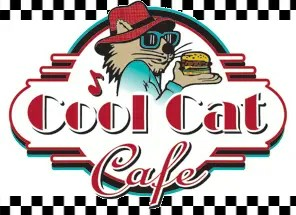 Hats off to the owners of the Cool Cat Cafe multi-state enterprise. Great food – check! Warm and inviting staff – check! Mmmmmaui Onions – check! We will see you next time when we boogey on down to have an order of Frings and a yummy adult beverage.